the huge dark grey reflective skull Is 5 foot above the ground. The sky is reflective. It is sunset. the sky is [bones]. 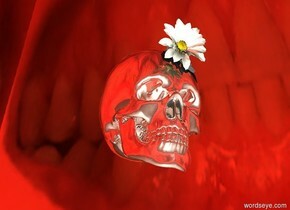 the huge grey daisy is -2 feet above the skull. the daisy is facing the camera. the daisy is leaning 80 degrees to the right. the sun is red. 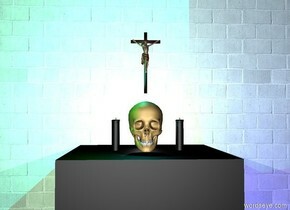 the white light is in front of the skull. the camera light is white. The ground has a sand texture . The ground is maroon. It is dawn. The bone is leaning 85 degrees to the right. The bone is 2 inches in the ground. The bone is neon. 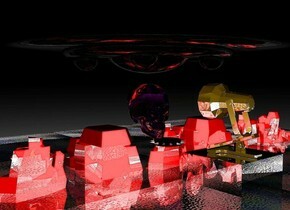 The camera-light is red copper. The tower is 10 feet behind the bone. 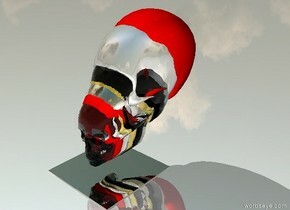 The skull behind the bone. 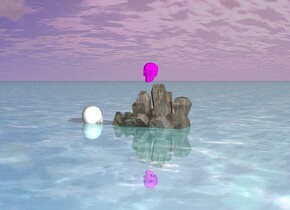 The skull is paint. The sky is orange. a 1st skeleton. it is shiny pink. 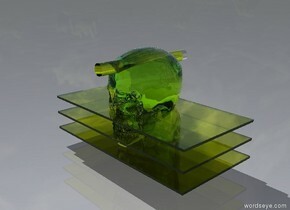 its skull is transparent. a 2nd skeleton. it is shiny green. it is 15 centimeters west of the 1st skeleton. a 3rd skeleton. it is pastel blue. 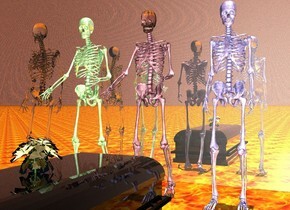 it is 20 centimeters east of the 1st skeleton. a 4th skeleton. it is transparent. it is 5 centimeters west of the 2nd skeleton. a coffin. its body is transparent. 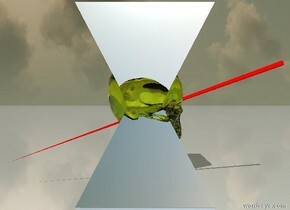 it is 10 centimeters south of the 1st skeleton. a flower. it is shiny. 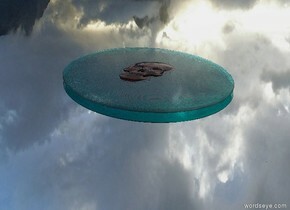 it is on top of the coffin. a 1st wall. it is silver. it is 50 centimeters behind the 1st skeleton. it is 50 meters tall. it is noon. the camera light is white. the ground is fire. the sky is stone. there is a 6 feet tall black skull. its tooth is red. there is a 6.5 feet tall clear skull -5 feet behind it. 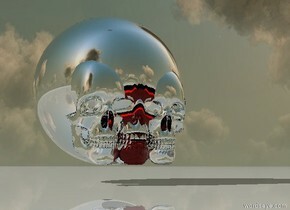 there is a 7 feet tall silver skull -5.3 feet behind the clear skull.. the ground is shiny. there is a 6 feet tall black skull. its tooth is red. there is a 6.5 feet tall clear skull -5 feet behind it. 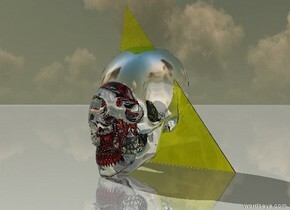 there is a 7 feet tall silver skull -5.3 feet behind the clear skull.. the ground is shiny. there is a 7.5 feet tall white skull -5.6 feet behind the silver skull. 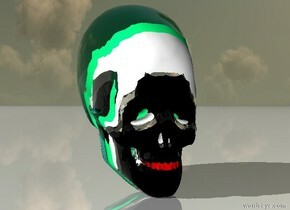 there is an 8 feet tall spring green skull -5.7 feet behind the white skull. 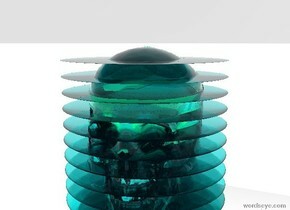 there is an 8.5 feet tall clear aqua skull -6.1 feet behind the spring green skull. The big brown horse on the ground. Ground is unreflective sand. It is midnight. ufo 5 feet above the horse. Green light 4 feet above the horse. Green light facing on horse. 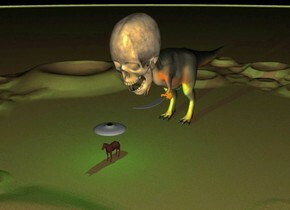 The huge dinosaur 10 feet behind the horse. 40 feet tall sword is -38 feet in front of the dinosaur. Sword is facing up. Sword is 28 feet above the ground and -28.5 feet to the left of dinosaur. 50 feet tall skull is -38 feet in front of the dinosaur. Skull is 32 feet above the ground. 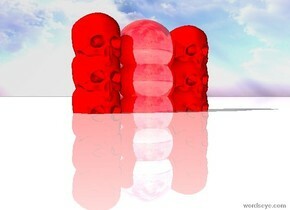 Skull is leaning forward. 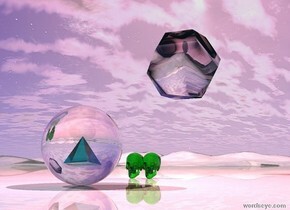 there is an upside down silver flat cube. it faces up. 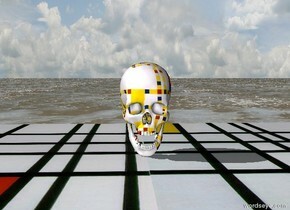 there is a clear black skull 2 inches above the silver flat cube. a white 0.9 feet tall skull is -7 inches behind it. its tooth is red. 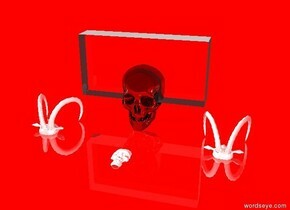 a 1 feet tall silver skull is -8 inches behind the white skull. 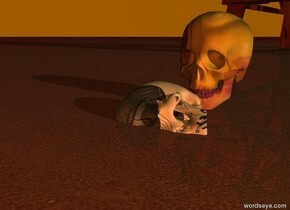 a 13 inches tall gold skull is -9 inches behind the silver skull. a 14 inches tall black skull is -10 inches behind the gold skull. 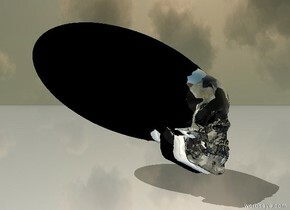 a 15 inches tall clear skull is -11 inches behind the black skull. 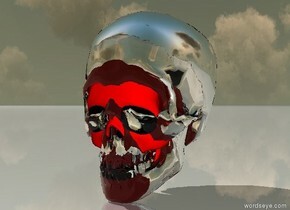 a 16 inches tall shiny gray skull is -14 inches behind the clear skull. it leans north. 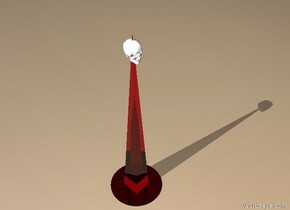 a 17 inches tall red skull is -16 inches behind the shiny gray skull. it leans north. the ground is shiny. there is a clear skull 5 inches above the ground. there is a 13 inches tall silver skull -9 inches behind it. there is a 14 inches tall black skull -10 inches behind the silver skull. 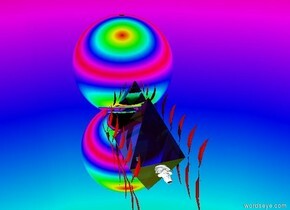 there is a black sphere -15 inches behind the black skull. it is 30 inches tall. it is 13.5 inches wide. it faces up. it leans south. the ground is shiny. it is morning . the fuchsia skull one inch above the rock . the big white head one feet from the rock facing north . the big white head is -8 inch above the ground . the ground is shiny aquamarine water .